Artists Ntombephi Ntombela, Nonhlakanipho Mndiyatha , Zondlile Zondo, Zandile Ntobela, and Thando Ntobela in South Africa. Ndwango (means "cloth") is a new form of bead art developed by a community of women living and working together in rural KwaZulu-Natal, South Africa. The Ubuhle (means "beautiful") artists' community was established in 1999 by local resident Bev Gibson and master beader Ntombephi Ntombela [En-Tom-be-Fi En-tom-bell-la] to empower local women with the means to provide for their families through their art. The flat surface of the textile onto which the Ubuhle women bead is reminiscent of the Xhosa headscarves and skirts that many of them grew up wearing. 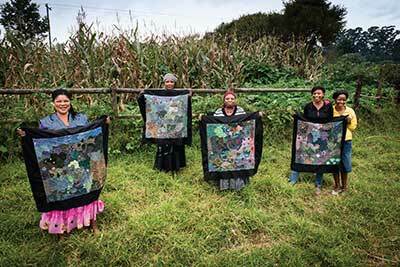 Using black fabric as a canvas and different colored Czech glass beads as the medium of expression, the Ubuhle community has re-imagined the longstanding beading tradition as a contemporary art form. Twenty-nine works are featured, including The African Cruxifixion.